Three days after securing its Air Operator Permit (AOP), Vistara opened for bookings, for flights 9th January 2015 onward. This marks the start of commercial operations in Q4 FY2014-15, a period which is traditionally the second weakest season for Indian domestic travel. 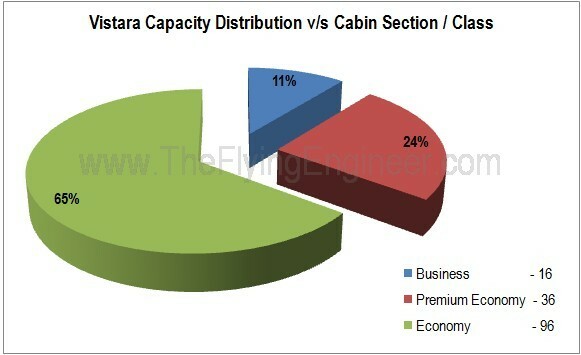 The airline places itself as a full service carrier (FSC), with a three class cabin. Rows 1 – 4 feature a four abreast Business Class Cabin with 16 seats. The seats sport a 42-inch seat pitch, with a 7-inch recline. Business class passengers will be pampered with a meal service with fine linens and bone china tableware. Meal options – for all classes – are shown on the left. Business class passengers will have a separate check-in counter at airports. Passengers are entitled to 30kgs check in and 7kgs carry-on baggage. Fares are in two categories – Business Flexi and Business Saver, with the expensive former waiving off a change fee while allowing the ticket to be valid for 12 months. Rows 5 – 10 feature a six abreast Premium Economy Class Cabin with 36 seats. The seats sport a 33-inch seat pitch, with a 4.5-inch recline. This cabin section includes two emergency exits at rows 9 and 10. These rows offer a 36 inch legroom, but the recline is unavailable on row 9 and perhaps restricted on row 10 due to the cabin partition wall right behind. Passengers are entitled to food and beverage. Premier Economy class passengers will have a separate check-in counter at airports. Passengers are entitled to 20kgs check in and 7kgs carry-on baggage Fares are in two categories – Premium Flexi and Premium Saver, with the expensive former waiving off a change fee while allowing the ticket to be valid for 12 months. Rows 11 – 27 feature a six abreast Economy Class Cabin with 96 seats. There are only 16 rows in this section, but the row numbering skips the number ’13’, misleading one to believe there are 17 rows. The seats sport a 30-inch seat pitch, with a 3.5-inch recline. The seat thickness will determine the actual legroom available. For example. IndiGo’s 29-inch seat pitch with its ultra slim dragonfly seats are thin enough to offer the equivalent of a 31-inch seat pitch legroom with standard seats. Passengers are entitled to food and beverage. Economy class passengers will have a separate check-in counter at airports. Passengers are entitled to 15kgs check in and 7kgs carry-on baggage Fares are in two categories – Economy Flexi, Economy Saver, and Economy Super Saver, with the expensive first option waiving off a change fee while allowing the ticket to be valid for 12 months. In addition, passengers who have web-checked in will have a separate counter to drop off check-in baggage. The airline also offers an auto check in service, in which if the passenger has not self checked-in at 4 hours prior to scheduled departure time, the airline will auto check the passenger on the flight and send the boarding pass via SMS or email. In total, every aircraft is configured with 148 seats. The lower number of passengers and dedicated counters may check in a smooth experience. Being a FSC, load factors may hover around the 75% range, leading to just 111 passengers per flight, on average – possibly a smooth boarding experience. Vistara’s IATA code is ‘UK’. On the first day of Operations – Friday, the 9th, January 2015, the airline will operate only on the Mumbai-Delhi and return sectors. Vistara’s regular flight numbers are expected to start with ‘9’. However, on January 9th, the airline will operate two flights to Mumbai from Delhi and one flight to Delhi from Mumbai, all with special flight numbers – 895, 890, and 228. Flights to and from Ahmadabad will commence the next day, on the 10th of January. With this, one aircraft will be stationed at Mumbai. The first commercial flight will be operated as UK890, which Departs Delhi at 12:30IST and arrives at Mumbai at 14:45 IST. The airline will commence operations with two aircraft, both Airbus A320-232SL, registered VT-TTB and VT-TTC. The airline will operate the following patterns from 10th January, with the first pattern for an aircraft out of Mumbai and the second for an aircraft out of Delhi. The pattern holds good for most days, with certain changes on Sunday. Reportedly, the pattern will run till 15th February 2015. The airline will operate from Terminal 2 of Mumbai’s Chhatrapati Shivaji International Airport, and Terminal 3 of Delhi’s Indira Gandhi International Airport. The concept looks really interesting. Premium Economy on regional flights is new to me. I’m really interested in how this will work out!